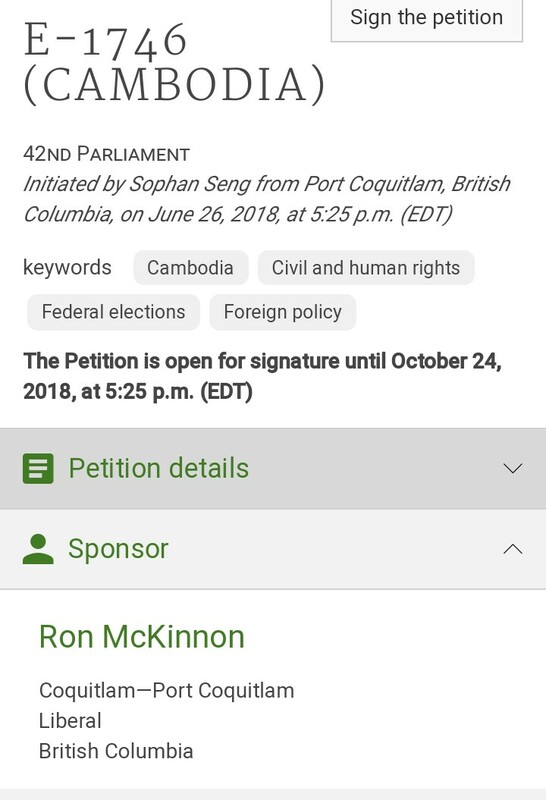 This September 22, 2018, Mr. Sophan Seng, President of the CEROC met and discussed with member of parliament for federal government in his Constituency Mr. Ron McKinnon who is also collecting support signatures for his Coquitlam-Port Coquitlam candidacy of the Liberal Party for the upcoming national election in 2019. 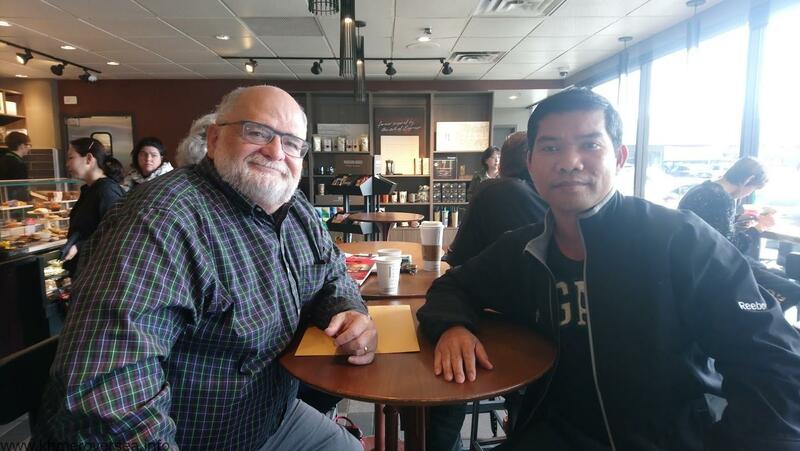 In the meantime, Mr. Sophan discussed in details about the human rights and democracy environment of Cambodia. 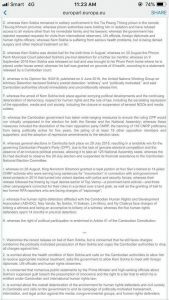 The election on 29 July 2018 has not been a free and fair election reflecting genuine will of the Cambodian voters at all because the key opposition party that have paralleling capacity to compete with the ruling party CPP was banned not to compete in the election by jailing its leader, banning top leadership of 118 politicians not to engage in politics, dissolving the Cambodia National Rescue Party (CNRP), taking away the parliamentary seats of 55 to redistribute to other parties, and taking away the commune-Sangkat councillors of 5007 posts voted by the people to its own party. Further more, the independence media were shut down, non-governmental organizations whose missions are to monitor election and democratization, both domestic and international, were pressured and dispelled. Freedom of expression and movement of labor unions were oppressed. As a result, the ruling party Cambodian People’s Party (CPP) grabbed all 125 seats from the election. 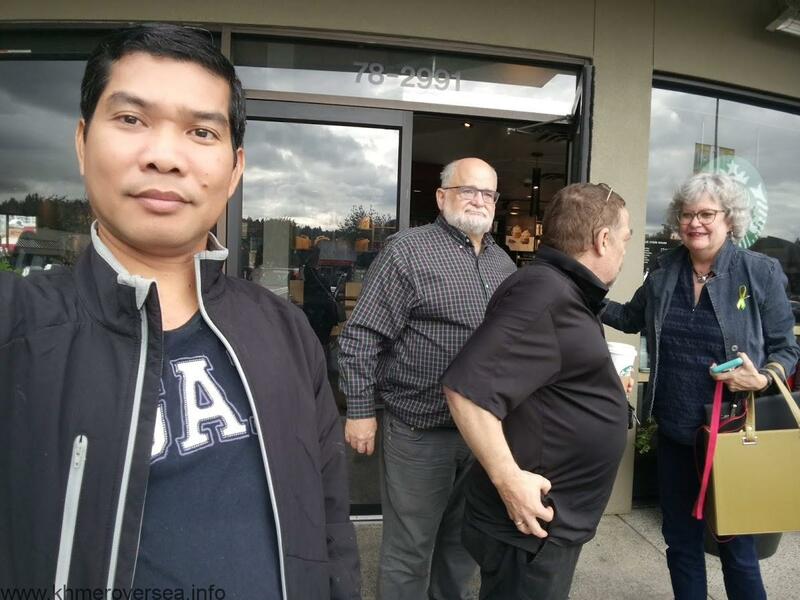 Right now, the European unions, United States of America, and the United Nations, who are partners of development and democratization each have condemned and approved resolution by interacting directly to Prime Minister Hun Sen to bring back normality by allowing CNRP to normal operation, release President of the party Mr. Kem Sokha from house arrest, and Mr. Sam Rainsy who is in self-exile by several political verdicts of the government to be able to return back home to conduct his political career freely, allowing all 118 politicians to freely engage in politics without having legal reprisals, giving back the 5007 posts of commune-sangkat councillors, allowing media, NGOs and unions to exercise their rights and freedom fully without obstacles. 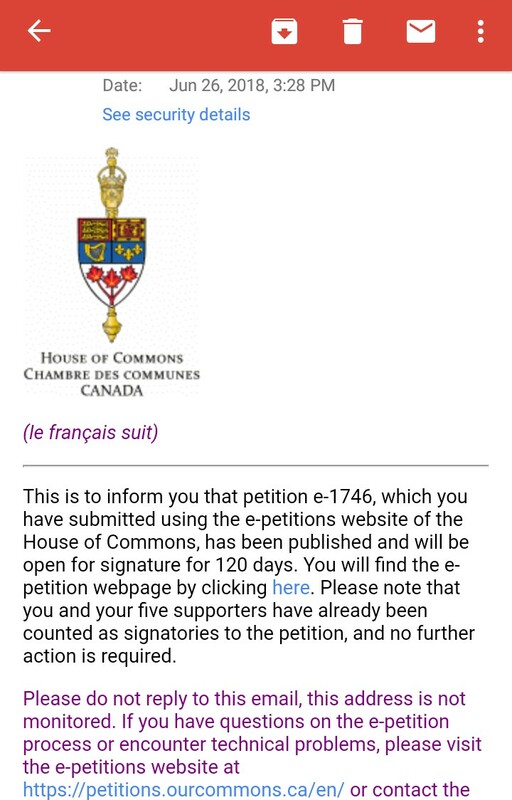 If not following this scenario, the European unions and the United States etc. 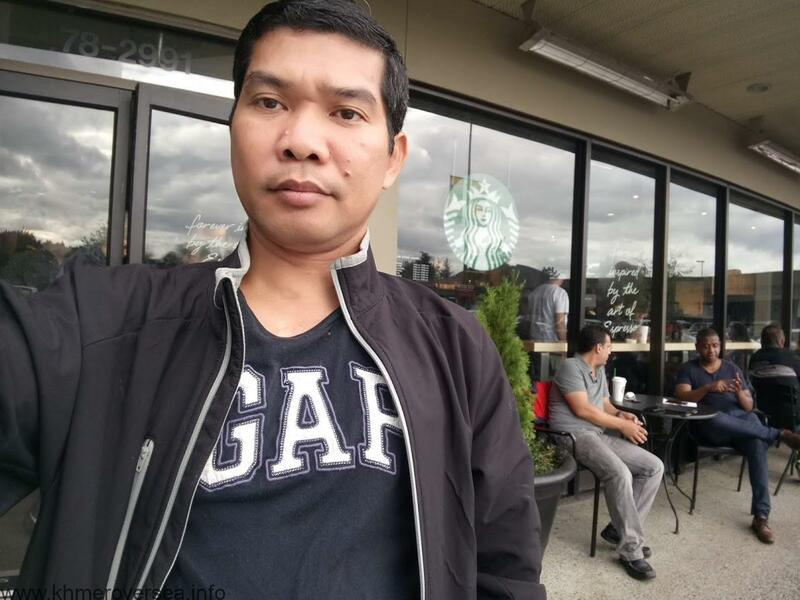 shall cut off the free-tariff on garment exporting value near 700 millions per year while diplomatic tie and aids will be in dilemma, and blacklisting will be created to punish those individuals who have engaged to human rights violation and de-democratization in Cambodia. Remarkably, the new government born after a fake election, just few countries recognized especially China who has come out to support and incorporate with Cambodia while major investments from China are the nontransparent FDI by conducting deforestation and mineral exploitation with bringing all China’s materials and manpower/workers in. 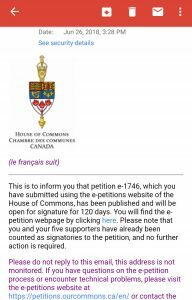 This problem reminds us of trade negotiation between Justin Trudeau and China which was failed completely because China insisted to bring their own materials and workers to invest in Canada. More than this, Mr. Sophan noticed on the anarchy of Chinese people in Cambodia particularly in Sihanoukville. 13. 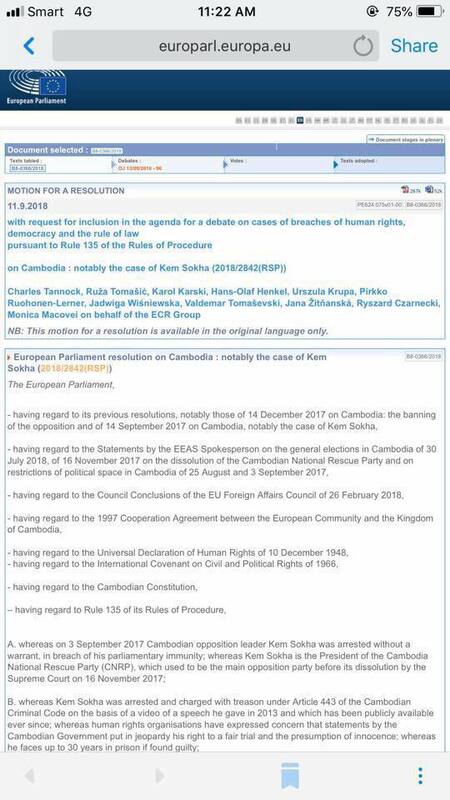 Instructs its President to forward this resolution to the Council, the Commission, the Vice-President of the Commission / High Representative of the Union for Foreign Affairs and Security Policy, the European External Action Service, the Secretary-General of ASEAN, the governments and parliaments of the Member States and the Government and National Assembly of Cambodia. 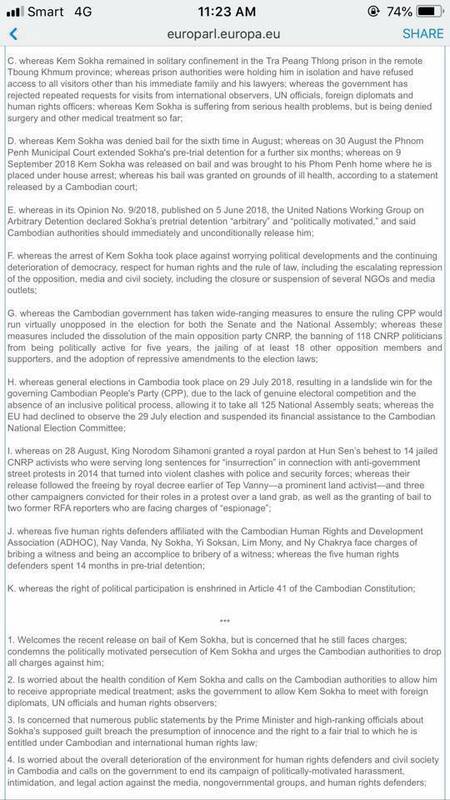 Name and sanction Hun Sen and other party cadres for the role they play in undermining democracy in Cambodia. The U.S. Treasury Department should use all available tools in its toolbox to freeze and seize assets of known individuals actively obstructing freedom in Cambodia. It should expand its use of existing Global Magnitsky authorities and use any other relevant authorities to place individuals on the SDN list. 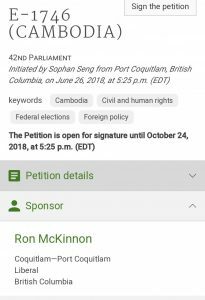 Such an action would send a clear signal to Hun Sen that the U.S. will intervene in necessary ways to get Cambodia back on the path toward democratic reform. 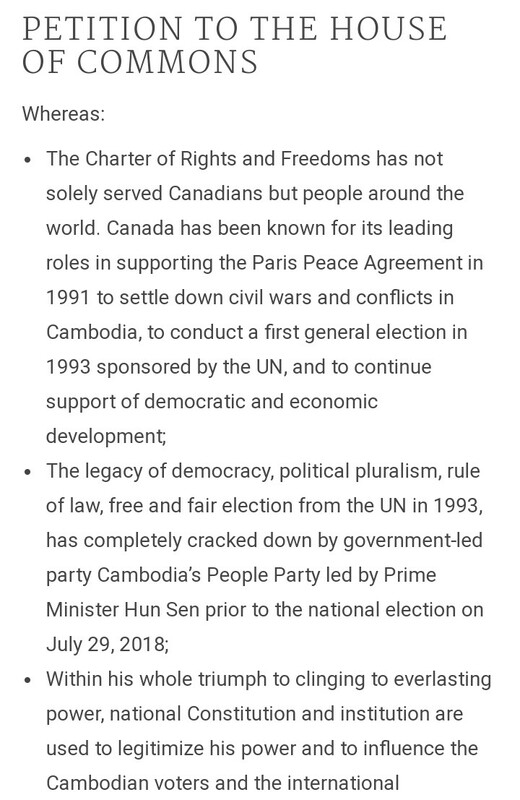 Create and convene an emergency meeting of the Cambodia Contact Group comprised of parties to the 1991 Paris Peace Agreement, including the United States, Japan, Indonesia, Australia, the U.K., and France, to monitor and press for democratic reform. 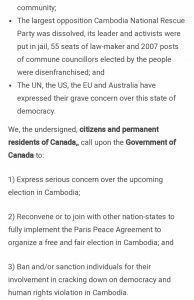 Among the purposes of the Paris agreement was to ensure “the right to self-determination of the Cambodian people through free and fair elections” and “assuring protection of human rights.”24 The signatories have a continuing moral obligation in this regard. The contact group should be used to coordinate human rights policies and assistance programs toward Cambodia. In short order, leaders from all of the countries at the foreign-minister level should convene to draw up coordinated plans to hold the Cambodian government accountable and get Cambodia back on the path toward reform. 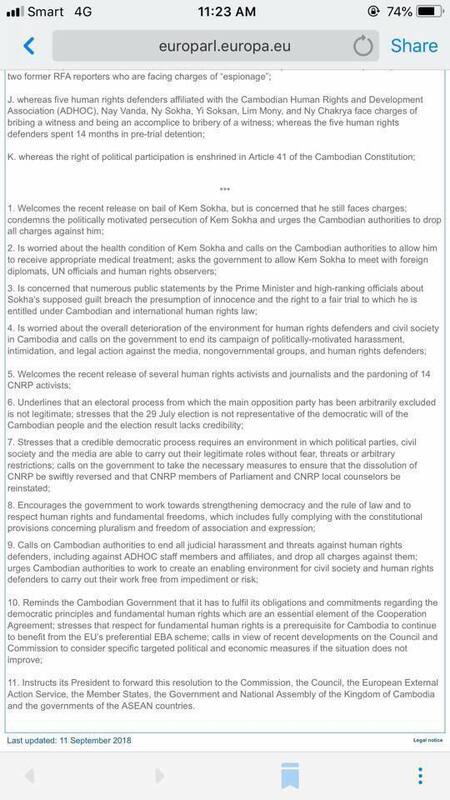 Condition assistance to Cambodia on the health of democracy. The U.S. should adopt stringent metrics for determining whether Cambodia is eligible for key assistance programs. Such language could mirror proposed conditions in the 2019 State, Foreign Operations, and Related Programs Appropriations bill.25 Language in the Senate version of the appropriations bill is particularly strong and specific. The U.S. government should conduct a thorough review of all assistance to Cambodia and consider instituting more severe restrictions on aid. 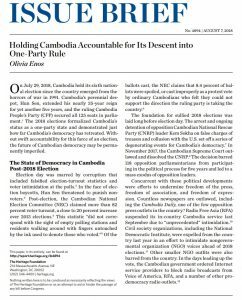 Emphasis should be placed on holding the Cambodian government accountable without harming the people themselves. As Singapore dredges sand out from beneath Cambodia’s mangrove forests, an ecosystem, a communal way of life, and one woman’s relationship to her beloved home are faced with the threat of erasure. I remember my first trip to the mangrove forests near the island of Koh Sralau and along Cambodia’s coastline. I had no idea how extensive the mangrove forests were or how spectacular they would be. The forests stretched for miles and miles, carving out small islands, narrow waterways and channels, and ecologically diverse estuaries. I wanted to document the impact of sand dredging on the mangroves and on the lives of the people who live and thrive in these forests and the oceans surrounding them. For over a decade, the government of Cambodia has granted several private companies concessions to mine these mangrove forests for sand. Each year, millions of metric tons of sand are shipped to Singapore to enlarge this island nation’s land mass, while Cambodia destroys its only natural protection against erosion, rising sea levels, tsunamis, and hurricanes and lays waste to a vital and fragile ecosystem that thousands of families depend on for their livelihood. 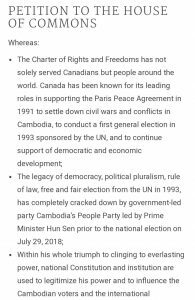 In late July, Cambodia participated (sort of) in the General Election, without having the option to choose the opposition Cambodia National Rescue Party (CNRP), which had been dissolved by the Supreme Court last November. The landslide victory by the ruling Cambodian People’s Party (CPP) all but assures Prime Minister Hun Sen of near total control of the country. For poll watchers, observers of democracy and human rights activists, the post-mortem reflection on Cambodia’s decline will be painful. But for how long? This brief analysis offers three likely developments in Cambodia that offer both a glimpse of optimism and words of warning. No. 1: Any imposed sanctions on Cambodia will fail: When the CPP clamped down on political freedoms, Western governments reacted strongly, yet predictably. Economic sanctions were at the top of the list of suggested responses. The United States called forsanctions for Cambodia in January after the arrest of CNRP leader Kem Sokha. Recently, the U.S. and the European Union have called for sanctions on high-ranking officials and more, including thoughts of stripping Cambodia of tax-free access to Western textile markets. If implemented, the loss of revenue could top $650 million. While that wouldcause few reservations for the CPP and Prime Minister Hun Sen, the impact would be felt by up to a million poor Cambodians who work in the textile and garment industries. Sanctions would almost certainly jeopardize efforts to boost national economic standing. The World Bank graduated Cambodia from LDC to lower-middle-income status in 2016and the United Nations has been supporting the country in efforts to move to upper-middle income status by 2030. Threats of sanctions reflect myopic foreign policies that fail to grasp the larger economic and political landscape. While Cambodia will not be able to find alternative Chinese markets for their goods, they will find political solace from Beijing and a new source of legitimate criticism in which to rest short-term political futures. The Americans should learn from the past. The U.S. imposed a trade embargo on Cambodia after the Khmer Rouge gained to power in 1975 and kept them through 1992. Cambodia relied then on China and communist states for their economic survival and it will soon again. Economic sanctions simply don’t work. They rarely have. No. 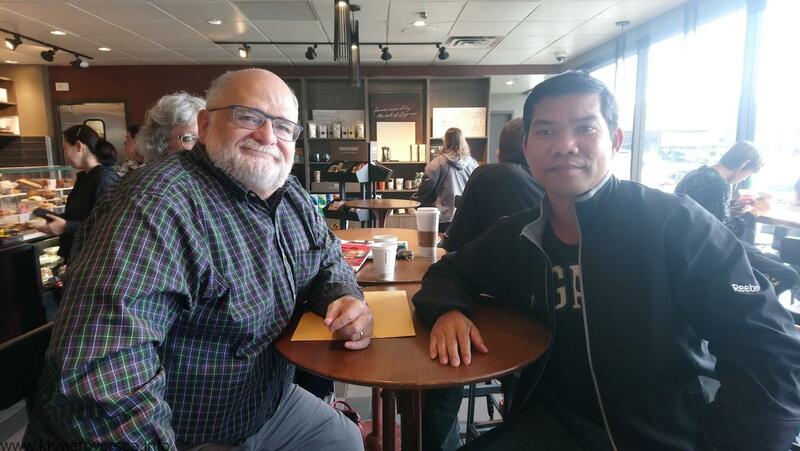 2: Cambodia’s civil society will re-emerge: Creeping authoritarianism in the months before the July 2018 election subjected Cambodian civil society groups working in Cambodia to repressive restrictions. Recently, the Center for Strategic and International Studies (CSIS) found that the judiciary has been used by the government to tighten controls on civil society groups that the regime saw as a threat, including the closure of some independent media organizations, violent responses to demonstrations, and arbitrary detention and arrest of human rights and political activists. The government passed the Law on Associations and NGOs in 2015, which provided a legal means for threatening civil society groups. However, the cost of repression is often high and civil society often quickly learns to adapt to acts of state violence. 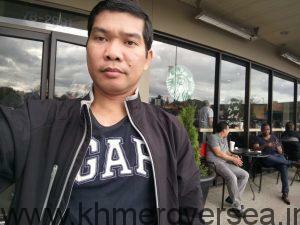 One need only look at Cambodia’s neighbor to the west as an example. Thailand imposed a number of repressive laws in the aftermath of the 2014 coup d’etat. Groups of five people were banned from gathering in public, political activists were arrested, and thousands were forced into re-education camps. But, five years after the coup, civil society is showing signs of re-emergence. Unless Hun Sen is willing to use much more repressive means to curtail civil society activities, it is highly likely that CPP dominance will face the same legitimacy challenges Prayut and the NCPO face today. Discounting the power of civil society in Cambodia is to not properly remember its history. 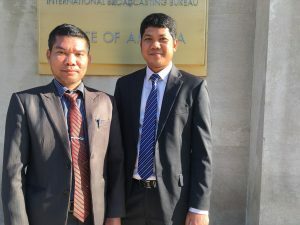 Cambodians who faced human rights challenges during the Khmer Rouge eramobilized society and formed the basis for a robust human rights movement–even before the arrival of UNTAC. While it may not emerge in the short-term, it will inevitably happen. 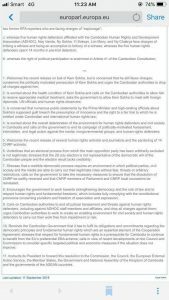 Committee for Election Rights of Overseas Cambodians (The CEROC) solemnly condemns the national election conducted in July 29, 2018 which has been in bias, unfair, and manipulating the 16 millions of Cambodian population. 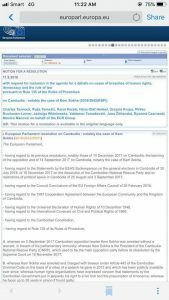 National Election Committee (NEC) is the biased body commissioned to manipulate the Cambodian people. NEC has employed staffs majorly from ruling party (CPP), and CPP has embodied themselves higher than key national institutions. Under the leadership of Prime Minister Hun Sen, economic development and infrastructure are just a decoration of outside look because during his mandate of over 22 years, Prime Minister Hun Sen and his entourages have exchanged national institutions to replacing with his loyalists and CPP party. 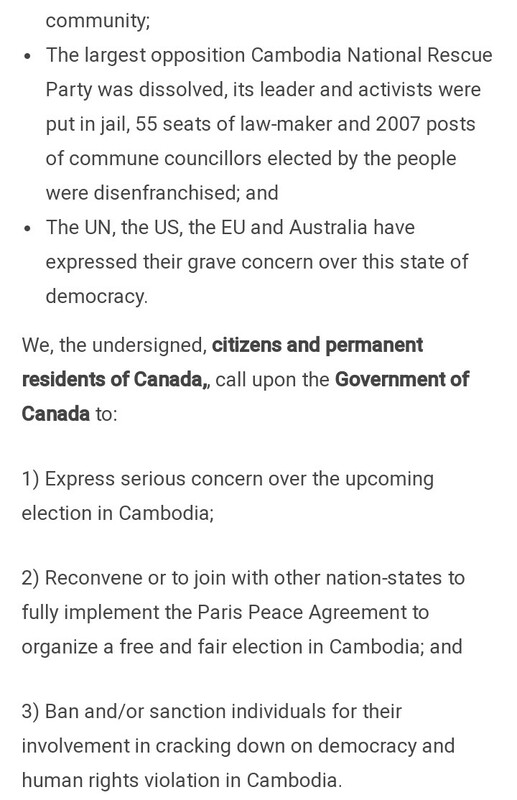 We would like to appeal all Cambodians overseas to firmly shoulder with Cambodian people inside the country to demand the returning back of democracy in Cambodia, to conduct a new election that could reflect the will of the people in choosing their representatives. International communities particularly those democratic countries must take action rather than just expressing concerns and making statement of election condemnation. 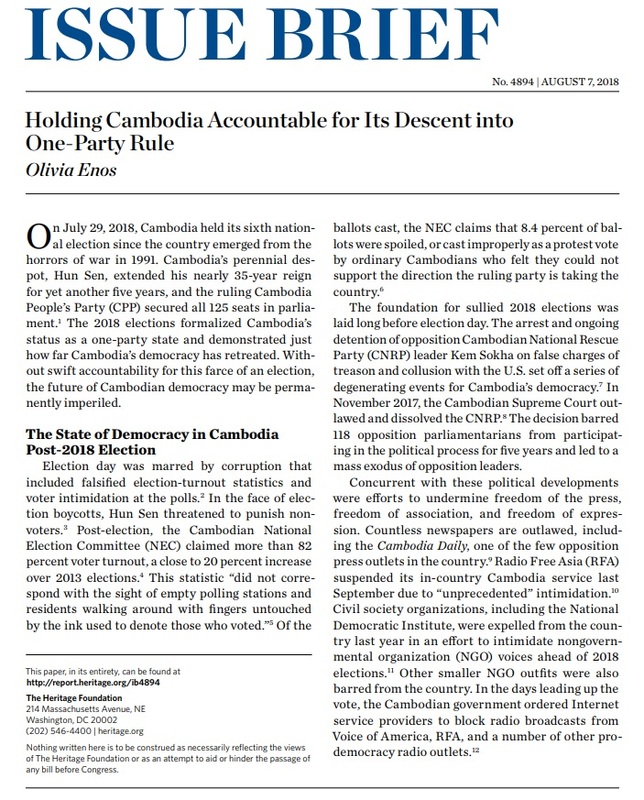 As lessons learnt, all democrats and international communities should make change of their direction from individual citizens’ capacity building to strengthening national institutions because during this period of 27 years, individual Cambodian has deepened knowledge of democracy principles but they have been remained victim of CPP that has evolved themselves to control major national institutions.